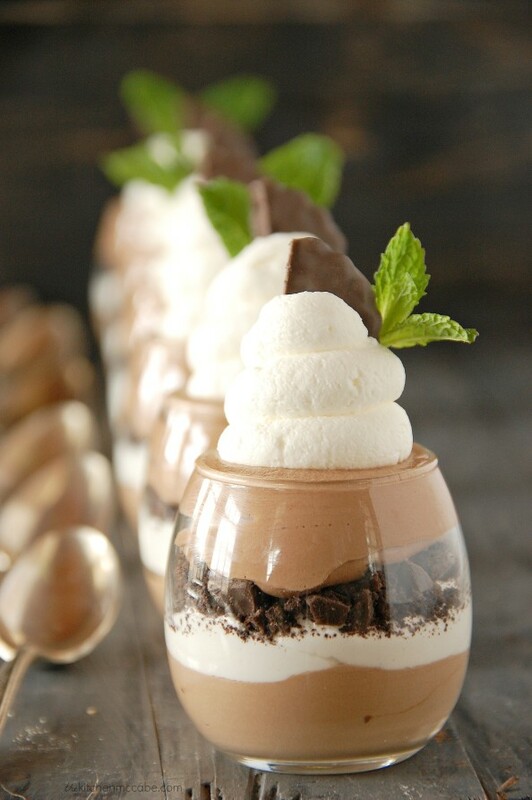 Who doesn’t love mint and chocolate together? I sure do. 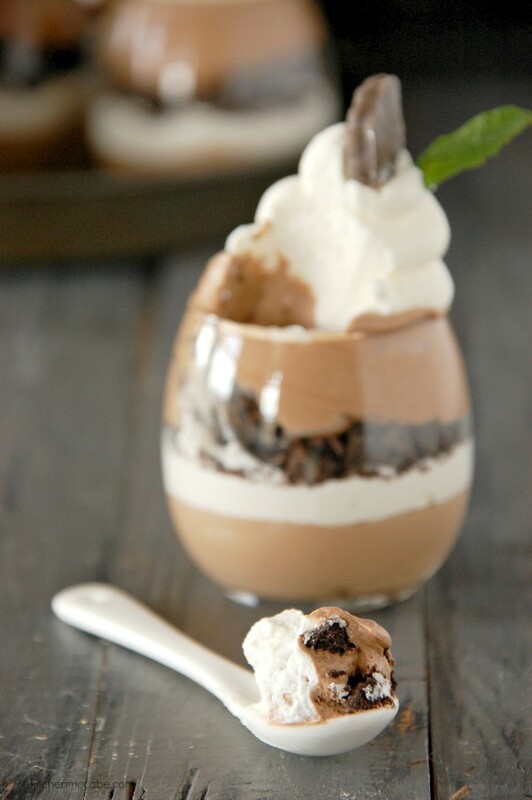 And I love these mint chocolate cookies and cream parfaits. I have a similar dessert posted that I made about two years ago, but lets be honest. The photography and presentation are an absolute travesty. I mean hideous in the extreme. So, I’ve updated it. 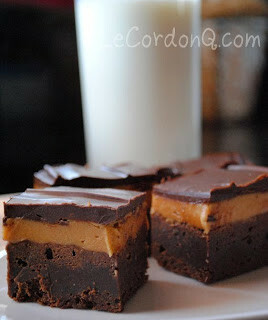 Both in pictures and in the recipe. 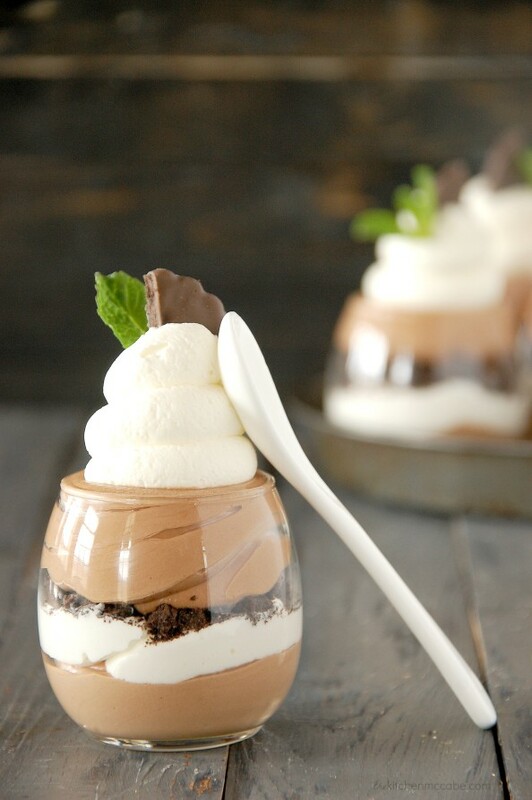 Now we have layers of velvety smooth, rich chocolate mousse, layers of sweet minted whipped cream, and a center of crushed mint chocolate cookies for a little texture. Top it all of with a fresh mint accent and we have a perfect combination of flavors and textures. 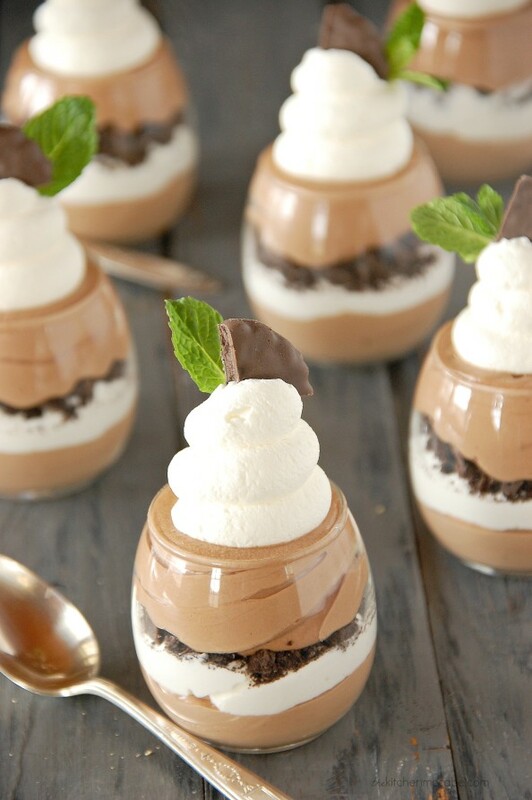 This recipe makes 4-6 individual parfaits, depending on the size of the glasses you have. I recommend keeping them on the smaller side. 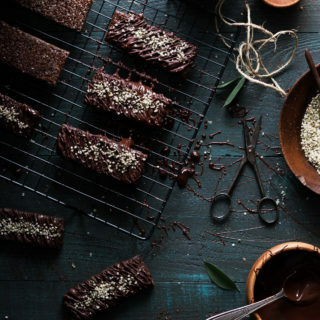 This dessert packs a punch of flavor and richness, so a smaller size will suffice. If you are looking for more St. Patrick’s Day food ideas, I have a few posted here, and here. Heat ⅓ cup + 1 T. cream in a saucepan until hot. Whisk together yolks, sugar, and a pinch of salt in a bowl until combined well, then add hot cream in a slow stream, whisking until combined. Transfer mixture to saucepan and cook over moderately low heat, whisking constantly, just until it thickens. Add in the vanilla and chocolate chips and whisk until the chocolate is melted and fully incorporated. Set aside to cool. Beat remaining cream, 3 T. sugar, and peppermint oil in a bowl with an electric mixer until it holds stiff peaks. Divide Whipped cream in half and set other half aside. Whisk one fourth of cream(of a half that was set aside) into chocolate custard to lighten, then fold in remaining cream gently but thoroughly. Spoon into a piping bag and set aside. Place the other half of the whipped cream in a separate piping bag. Crush the mint cookies into small chunks. 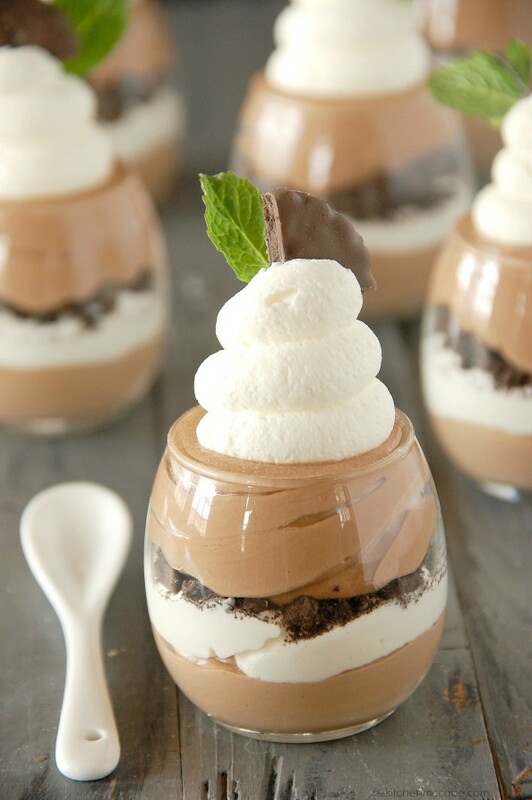 Pipe a layer of chocolate mousse in the bottom of 6 small glass dishes. 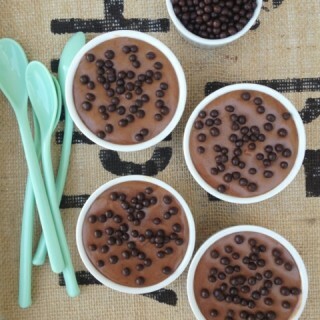 Pipe a layer of the mint cream on top of each chocolate mousse layer. Sprinkle about 1 T. of crushed cookies in each glass. Pipe another layer of chocolate mousse on top of the cookies. 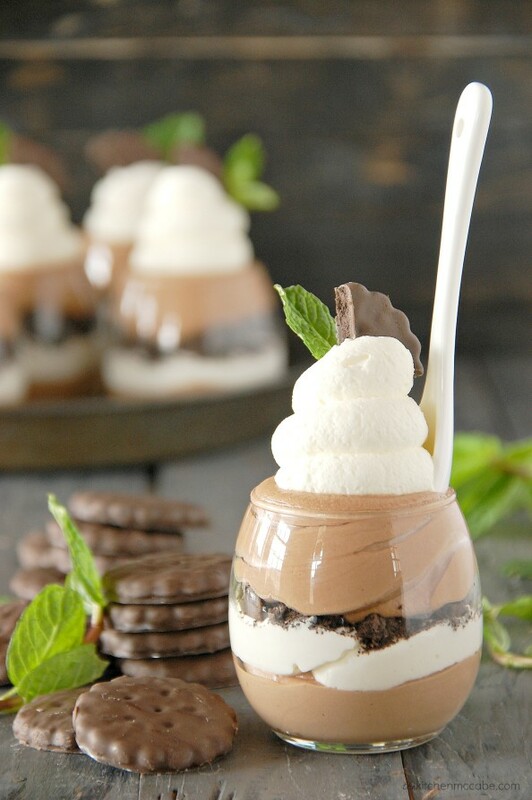 Pipe a swirling of mint cream on top of each glass and place a piece of cookie and a mint sprig on top of the cream. Let set in the refrigerator for 2-3 hours. Serve well chilled.